Background: The synthesis of N-polyheterocycles by environmentally benign method is highly attractive but challenging proposition. New strategies have been developed for the preparation of polycyclic heterocycles in the last decades. 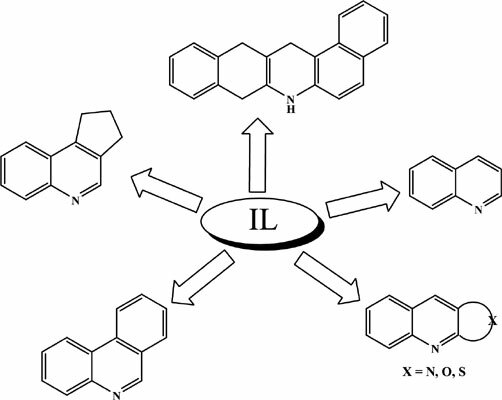 In this review article, the synthesis of nitrogen containing six-membered polycyclic heterocyclic compounds is presented with the application of ionic liquids. This contribution focuses on the literature related to the total synthesis of six-membered N-polyheterocycles. Objective: Ionic liquids not only acted as environmentally benign reaction media but also as catalysts which afforded the very promising replacements of traditional molecular solvents in organic chemistry due to their stability, non-flammability, non-volatility and ease of recyclability. Ionic liquids are utilized in metal catalyzed reactions in place of organic solvents in the last years. It has attracted considerable attention in recent years. Ionic liquids acted as alternatives of organic solvents and these ILs are environment friendly. Conclusion: In the area of green chemistry ionic liquid assisted synthesis is a very promising technique which afforded a flexible platform for the formation of heterocycles. The influence of ILs on the development of efficient and new synthetic protocols over the last decade for the construction of N-polyheterocycles is featured in this review article. These synthetic strategies will continue to attract more attention and will find a wide range of applications in organic synthesis. In conclusion, ionic liquids assisted syntheses have become an efficient and powerful tool in organic chemistry quickly. Ionic liquid, nitrogen, heterocycles, green chemistry, N-polyheterocycles, organic synthesis.